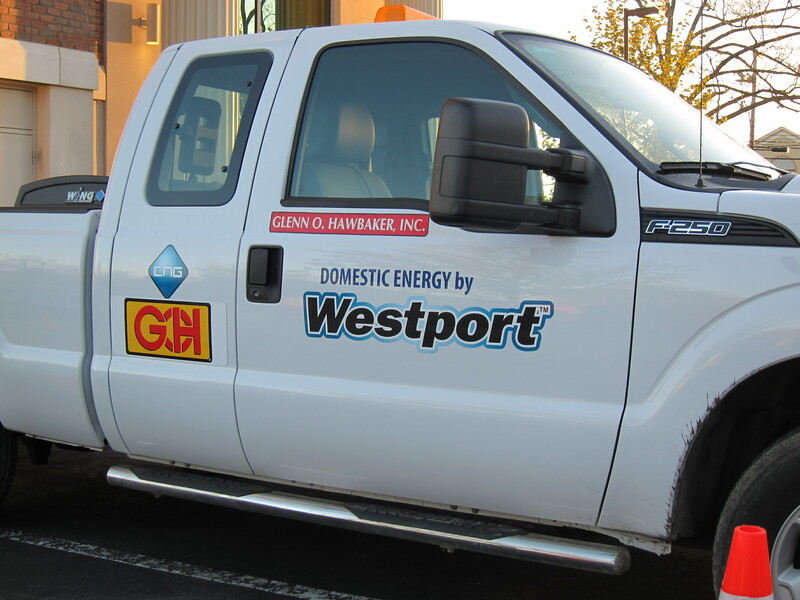 May | 2013 | Glenn O. Hawbaker Inc.
On May 2 when the first CNG fueling station in northern PA opened GOH was there with a dual fuel pick up truck to support the effort to utlize this abundant resource in our own backyard. Athens, Pa. At one convenience store in Athens, Pa., it’s once again possible to fill an entire tank — of a vehicle — for less than $30. But the vehicle must be equipped to run on compressed natural gas. Dandy Mini Marts celebrated Thursday the new opening of a station that only sells compressed natural gas. It’s only the second fueling station of its kind in northern Pennsylvania. Dandy Mini Mart opened its first CNG station in January in Towanda and it has plans to open one later this summer in Elmira. His leap of faith was met with open arms by some elected officials. Chesapeake Energy is converting 50 of their business vehicles to run on CNG fuel, and promises to only fuel up at the Athens Dandy Mart. The station was built using an alternative fuels incentive grant. It teams up transit, fuel and distribution companies to take part in converting natural gas to fuel. Dandy Mini Mart, Chesapeake Energy and BeST Transit were recipients of the grant. BeST Transit filled up its first CNG-fueled bus during Thursday’s opening ceremony. Pennsylvania College of Technology President Dr. Davie Jane Gilmour on Wednesday evening thanked those who have invested in the institution through gifts that help students achieve their goals, ensure that faculty have the resources they need and make improvements to its campus. Supporters and friends of the college were honored for their gifts at its ninth annual donor recognition event held in the lobby of Penn College’s Student and Administrative Services Center. Glenn O. Hawbaker, Inc was among the donors. Gilmour expressed her gratitude for the gifts from individuals, families and businesses. “The impacts of these gifts are felt throughout the campus,” she said. Several donors were recognized by having their names placed on the college’s donor wall inside the building. Gifts to the college are crucial to support its programming and academic offerings, Gilmour said. She added that scholarships, in particular, help make the difference for students who attend Penn College. Gilmour also honored Penn College employees, who collectively have given $1.1 million during the past several years. “My gratefulness is beyond words for the contributions of our employees,” she said. Tim and Marilyn Satterfield, owners of NuWeld, 2600 Reach Road, said they support Penn College because they know they will get trained employees from the institution who are ready for high-tech jobs at the company. “We’re just think it’s great to have the college here in the area,” said Marilyn, who added that two of their four children are Penn College graduates.